Millionaire Chess and the Internet Chess Club are working together, to make this amazing tournament even more enjoyable to all the chess players. The ICC will give ALL the participants 6 months of FREE membership! If you register for the tournament, you will be presented with an ICC coupon. You can REGISTER HERE. Be sure to enter "035" or "ICC" in the bottom-right box labeled "Team Number or Team Name." The early entry fee for the Millionaire Open is $1,000 U.S; it expires on July 31 2014. 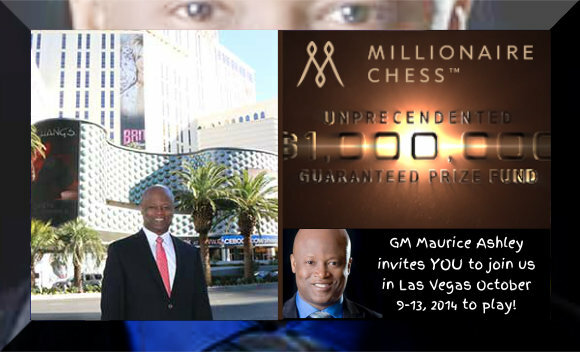 The price will then be $1,500 U.S. until October 8 2014, when it will rise to $2,000 U.S.
GM Maurice Ashley is receiving praise from everywhere for this initiative, which brings Chess into the sport elite. Even celebrities such as the famous actor Will Smith stated their appreciation for the Millionaire chess Open: "I commend Maurice for creating a venue that showcases chess to the world. The Millionaire Chess Open is a fantastic concept that will invigorate current players, and the next generation of Grandmasters." The one-million-dollar Open starts October 9, 2014., and its format is not the usual Open's one: the first seven rounds of every section will be a qualifying round to determine who plays the finals on Millionaire Monday. Four finalists will move on to play two knock-out rounds to determine who wins the top prize. The last two rounds of the Open section will also be played on Millionaire Monday to determine who wins 5th place and under, as well as to give players a chance to acquire norms. In the other sections, the tournament will be officially over by Sunday night, October 12 for players who did not make it to Millionaire Monday. As of now, 200 players have registered, of which 13 GMs. Strong GMs like Bu Xiangzhi, Alexander Dreev, Parimarjan Negi, Sam Shankland and Aleksandr Lenderman have signed up. The organizer Maurice Ashely and Amy Lee expect many more GMs and chess players to sign up, especially before July 31, when the entry fee will rise from 1,000 to 1,500 US dollars. ICC will relay the games live from the Millionaire Open and ICC members will be able to follow the live commentary directly in ICC.